Learn about the temperament and personality of the American Water Spaniel. Discover what he's like to live with, his traits and characteristics and how he generally behaves. And look at lots of American Water Spaniel photos. 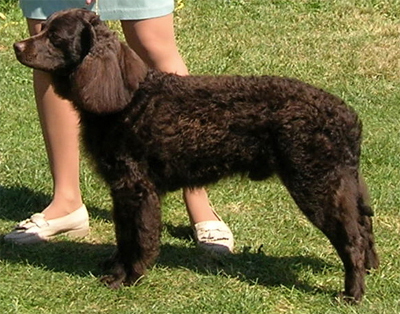 The State Dog of Wisconsin, the American Water Spaniel, was bred to be a companion as well as a retriever. This is an athletic, active, and energetic dog who loves his daily exercise. They need to be kept busy in order to work off some of their energy. Though they are great all-around hunting dogs, they also enjoy runs in the park, swimming, playing in the backyard, obedience training, and agility work. He needs to exercise his brain as well, as he bores easily, and if gets bored, he can be destructive. He is a very vocal dog and can be quite the little barker, but training can help with this. He is intelligent, eager to please, and responds well to obedience training. He is a happy, friendly, tenacious, outgoing dog who loves to be the center of attention. The American Water Spaniel is moderately easy to train. He learns new commands at the average rate. He is neither difficult nor easy to train. The American Water Spaniel sheds a fair amount of hair. You'll find hair stuck to your couch, carpets, clothes and everything else in your home. The medium-length coat of the American Water Spaniel requires brushing a few times a week to keep it tangle-free. Tells you how easy or difficult a breed is to train. A higher rating means the breed is easier to train, a lower rating means the breed is harder to train. An easy to train breed require less time and patience to train. Tells you how intelligent a breed is in terms of how quickly it can learn commands from humans. A higher rating means the breed will learn your commands faster (and is therefore generally considered to be more intelligent), while a lower rating means the breed will learn your commands more slowly (and is therefore generally considered to be less intelligent). Keep in mind that this is only one way to measure a dog's intelligence and a low rating might still mean the breed is highly intelligent in other ways. Tells you how much hair the breed sheds. The higher the rating the more hair the breed sheds. Tells you how good the breed is at being a watchdog and raising the alarm when a stranger approaches. A higher rating means the breed will bark vigorously to warn you of a stranger's presence on your property. A low rating means the breed probably won't bark much if a stranger enters your property. Tells you how good the breed is at being a guard dog due to the appearance, size, and strength of the breed. A breed with a high guard dog rating will make an intruder think twice before stepping foot on your property. Tells you how popular the breed is in terms of ownership. A higher rating means that more people own the breed. The more popular a breed is the easier it is to find and purchase one because there are more breeders breeding it. Tells you how large or small the breed is. A lower rating means the breed is smaller and a higher rating means the breed is larger. It gives you a quick idea of how physically large or small the breed is compared with all the other breeds. Tells you how agile the breed is. A higher rating means the breed is fast and nimble on its feet while a lower rating means the breed is heavier and slower on its feet. Tells you how good the breed is with children. A higher rating means the breed is good with children. Note: all breeds are generally good with kids when they're raised with them. © 2019 justdogbreeds.com. All rights reserved.